Unlike major chain garages, our company does not have to deal with major corporate overhead that helps to drive up prices for our customers when they look to us for auto glass Yorba Linda services. Instead of pocketing this profit, Express OC Auto Glass passes these savings on to you through the form of lower prices and our free mobile replacement service. In the unlikely event you experience an issue with a windshield we have replaced for you, just give our staff a call, and we will make an appointment with you to take care of the problem. If you need our windshield chip repair service, we can help you. We do ensure that all windshields installed by our team meet manufacturer and Department of Transportation safety specifications. This helps keep our customers safe, and we will never do anything to put passenger safety at risk. Many of our customers also request a concurrent window repair services while our mobile team is on site to replace their windshield. Not only is this possible, but we recommend it so that our staff can take care of all of your auto glass needs in one visit. This helps save you time by only having to arrange for one appointment with our team, and whenever you need a company who knows what they are doing when you need a windshield replacement, just give our friendly team a call. 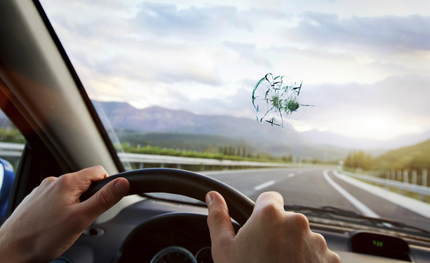 We have also found during our more than 10 years of being in business serving the Yorba Linda area of Southern California, that many of our customers do not realize that a windshield chip poses just as much danger as a windshield crack. Both of these types of damage can grow to the point of the auto glass requiring a full replacement service vice a basic glass repair. Additionally, if you have a number of chips in the windshield, it can result in the glass strength being reduced to the point that your airbags may fail to deploy properly when involved in a horrible car accident. In these cases, the airbag may actually push the windshield out of the frame of the vehicle and fail to protect yourself or the passengers in the automobile. Please give us a ring today to see how we can help you with your windshield or other auto glass replacement needs. Our company policy is to always provide you with a free estimate on our work, and all of our glass services are backed by a 100% warranty after we call the job done. We look forward to working with you, and our company will always give you a free estimate on our work with no strings attached.